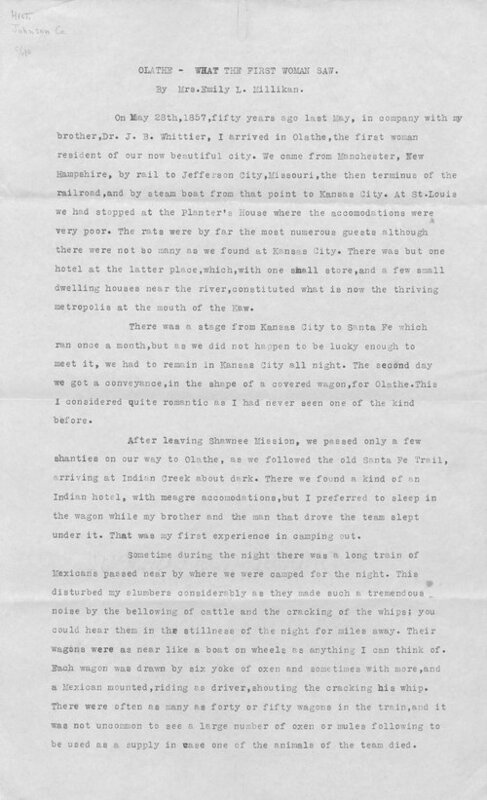 In this item, Mrs. Emily L. Millikan recounts her experiences related to her May 28, 1857 arrival in the Kansas Territory. Arriving with her brother, Dr. J.B. Whittier, Millikan explains that she was the "first woman resident" of Olathe, Kansas. Millikan also discusses such things as traveling via wagon, visiting the Shawnee Mission, and meeting Native Indians. Millikan states that the first women she encountered in Olathe were "two big squaws who unexpectedly stuck their heads through a broken pane of glass in the room where I was and greatly startled me." People - Notable Kansans - Millikan, Emily L.
People - Notable Kansans - Whittier, Dr. J.B.